Way back when the Mets were 16-10 on May 6th, I wrote an article about the legendary Izzy and asked Mets Today readers (and pundits) to predict the amount of games the Mets would win. The bold ones amongst you did just that. And, so far, you’re doing pretty darn well. 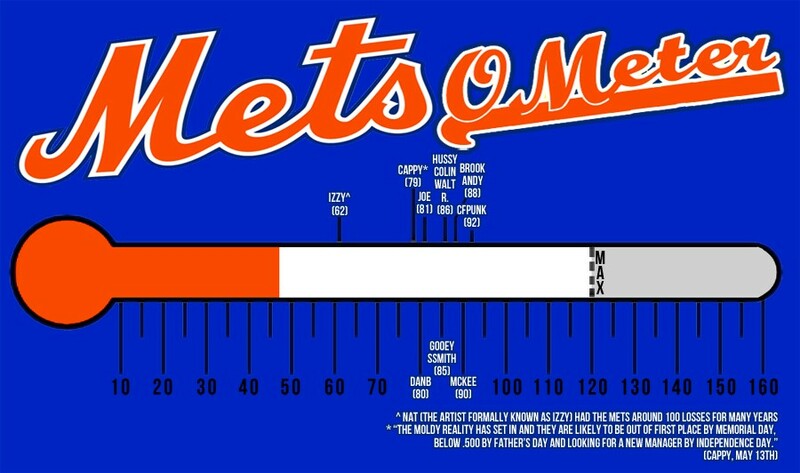 You can chart your progress on the Mets-O-Meter as the season rolls on after the All Star Break. If you haven’t already told me how many wins you thought the Mets would get at the start of the season… comment and I’ll add you to the chart. I’ve got my £10 riding on the Mets winning 86-88 games. And you’ve got a piece of lovely Mets merchandise to win if you get the correct number. No hindsight, though… it’s strictly forbidden. Lemme explain why.